Well, I couldn’t avoid writing about it forever. The Australia – India Test series was actually quite good, but now everyone involved has come out of it badly. 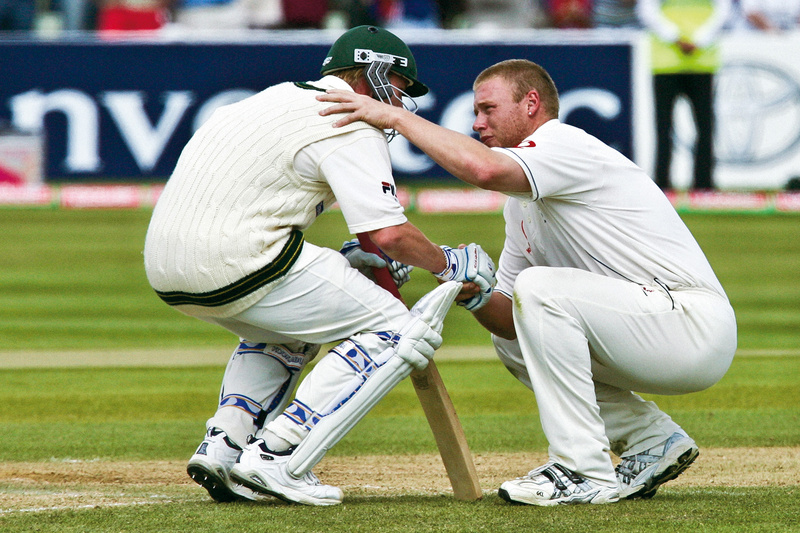 Symonds, it was revealed, was needlessly aggressive towards Singh when the latter patted Brett Lee on the back (which used to be A Good Thing, didn’t it? ), and never managed to earn much sympathy from neutral observers. Singh has confirmed suspicions that he is a bit of a wally. He can’t even be defended on cricketing grounds, as his figures in the Test series were pretty poor. The guys in charge came out perhaps the worst. Cricket Australia is facing accusations of selling out its players for the sake of political and financial expendiency. As for the BCCI, they basically threw a temper tantrum until things were resolved to their satisfaction. Of course, the ICC hardly helped. Their stock has fallen further and faster in recent years than Northern Rock’s, and they show no sign of getting their act together anytime soon. If all that is a touch depressing, here’s a more positive ‘monkey’ story. Shaun Tait’s given up cricket indefinitely, Harbhajan Singh has controversially been cleared of making racist remarks to Andrew Symonds, and Shane Bond has traded in his International career for the ICL. So what am I moved to write about? The Stanford 20/20, of course. The tournament is perhaps the brashest, boldest and most exciting 20/20 tournament in the world (if you don’t believe me, listen to the official theme ) . Even though plans to include Cuba this year have been scuppered by the US embargo on the island, the tournament never fails to remind me of all that is good in West Indian (and world) cricket. Plus, it’s trying hard to get the Yanks involved, and is so colourful it makes the English county One-Day game look like an old photograph. Andrew Symonds. He hunts wild animals with his bare hands. Do you? Thought not. Inzamam-ul-Haq. A big man, but out of shape? Well, when a spectator called him a ‘potato’, Inzy went at him with a menace and vigour not normally associated with ‘larger’ gents. So maybe those fat jokes are best kept to yourself. Ian Chappell. As Mike Brearley put it ,”..Ian Chappell as a captain turns a cricket match into gang warfare”. And the ‘Ugly Australians’ were quite a gang. Shivnarine Chanderpaul. Shot a policeman in Guyana. Admittedly, Shiv had mistaken him for a mugger, but how many cricketers have revolvers? Shoaib Akhtar. Especially if he was armed with a cricket bat (or indeed a cricket ball), or if you were one of his team-mates. 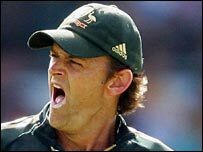 Adam Gilchrist. Looks like he’s just stepped out of a bar-room brawl, and often talks like it too. Although some in England have a sneaking suspicion he may be all mouth and no trousers, not many have taken the risk of finding out. C B Fry. He played in an FA Cup final, held the long-jump world record, batted for England and was offered the throne of Albania. Chances are, he was probably quite handy in a fight as well. Shahid Afridi. He, is , quite frankly, properly mental. Who knows what he’d be capable of in a fight? Javed Miandad. Famously took on Dennis Lillee, with bat wielded “like a deranged javelin thrower”. Yuvraj Singh hits six sixes of a single over. Poor Stuart Broad. It’s been done before, of course. Malinga takes four wickets in four balls. Andy Caddick, of course, was doing that sort of thing years ago. Seems Sachin’s been at it again. After what I wrote yesterday, it might seem that an experienced Indian batsman making a century would be the last thing I’d expect. But the Little Master deserves different treatment from Dravid or Ganguly, in my eyes at least. In much the same way that I was keen for Brian Lara to play on for as long as possible in all forms of the game, I would hate to see Tendulkar retire. He is, almost literally, a talisman for Indian cricket, much as Lara was for the West Indies. His mere presence is enough to strike fear into the hearts of any bowling attack – even Australia’s. If an old head is needed in Indian cricket, I would much rather it was Tendulkar’s than Dravid’s or especially Sourav “Prince of Wales” Ganguly’s. And as for Dravid and Ganguly, those fine batsmen who any team would be mad to get rid of? They got 25 runs between them in the first innings. Are India right to drop Dravid and Ganguly? Dileep Premachandran has written on the Guardian sport website that India’s decision to drop Ganguly and Dravid for the One Day side is, to say the least, a bit premature. Personally, I think that it’s time to move on. Yes, as Dileep points out, the young generation of batsmen aren’t quite there yet. Also, it’s true that the ‘transition’ hasn’t been handled very well by the men in charge of Indian cricket (what has been handled well by the BCCI?). But One Day International cricket is hardly renowned for its sentimentality. Things have changed almost beyond recognition in the limited-overs form of the game, not least due to Twenty20 (which India’s young team are quite good at, I seem to recall), and ‘experience’ is now becoming less valuable in comparison to the ability to field aggressively, not something either Dravid or Ganguly are famous for. In terms of the batting lineup, then there will of course be a cost involved. But if England had not have taken the decision to drop Graham Thorpe (who had averaged over 50 in the run of Test success following Michael Vaughan’s installation as captain) in 2005, then a certain Mr. Pietersen might not have featured in a certain couple of games against Australia that summer. I’m not suggesting that India’s new One-Day side will now immediately discover a talent as explosive as KP, but if you want to make an omelette, a few of the Lion Standard might get broken.